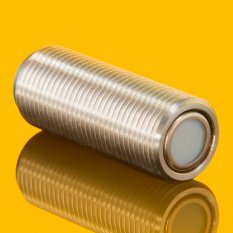 The sensor TOCON-probe is an amplified UV photodiode inside a robust stainless steel M12x1 thread body. It is configured with an integrated sensor connector (Binder 4-Pin plug) and comes with a 2 m connector cable. The sensor is easy to mount and connect. The TOCON-probe is amplified and shielded against electromagnetic interference. The visible blind sensors are based on a Silicon Carbide (SiC) UV sensing chip, which guarantees highest radiation hardness, long term stability and >1010 visible blindness (ratio of UV to VIS-IR sensitivity). Blue and GaP type sensors are based on a Gallium Phosphide (GaP) UV sensing chip.